The Crookes consist of George Waite (vocals/bass), Daniel Hopewell (guitar), Tom Dakin (guitar) and Russell Bates (drums). They live in Sheffield and infamously found (most of) each other, bleary of eye and dancing alone, on the indie dance floor at the city’s Fuzz Club near the close of the previous decade. Five years, 40-odd songs and hundreds of live shows down the line, The Crookes are now hardly lacking in fans, followers or worthwhile friends but Don’t Put Your Faith In Me – the second single from their Soapbox album, itself released on fierce panda on April 14 (their third, which makes The Crookes the first band to release three albums on fierce panda since Death Cab For Cutie a decade ago) – still sees them revel in the role of loners. Sheffield’s hard-grafting purveyors of incisive indie pop The Crookes have announced the release of their new album Soapbox on Monday 14 April via fierce panda records on CD, LP and digitally. The Crookes consist of George Waite (vocals /bass), Daniel Hopewell (guitar), Tom Dakin (guitar) and Russell Bates (drums). Soapbox saw the band forego the studio-related home comforts of South Yorkshire and instead drive their gear and recording facilities to the Alpine wilds of Italy at the start of winter. If these pleasures were a wayward distraction then the band’s sense of isolation manifested itself in Soapbox, a record which is littered with put downs and push offs. The album kick starts with recent single release, Play Dumb. Play Dumb has a brilliantly crafted chorus, “I’m under your thumb/I’m trying hard not to play dumb/But I don’t need you no more/I’m waking up dumb…” The thumping drum beat introduces the track and is bound to get you moving. Play Dumb is worthy of being a single release; its upbeat, fast tempo makes this song instantly irresistible. Don’t Put Your Faith In Me has a slightly darker tone than the previous track. The vocals are more paramount on this track and the music more simplified. The bass riff carries this song. There’s a little bit of doo-wop style in this song. It sounds like a 1950s diner ballad. The next track Echolalia has a 1980s sound to it. The music has a lot of 80s influences giving it that old yet modern soundscape style. The rhythm guitar is minimal whereas the bass is pushed to the forefront giving it that punch. Echolalia has layers of instrumentation which keeps this song interesting. The way Waite sings “Echolalia” is beautiful. Before The Night Falls has influences of Pete Doherty in Babyshambles in the vocals. The Crookes’ indie sound is mixed with a doo-wop style and dramatic chorus making it the perfect indulgence. It has drama and emotion as well as a dance-able beat. Holy Innocents is the ballad of the album. The vocals are accompanied by a simplistic yet tear-jerking piano melody and sad vocals where Waite’s voice cracks occasionally. The lyrics are beautiful and tell a narrative, “Maybe I remember every word you ever said/As day bled to night from the corner of your bed/I swear to God we were holy innocents/Your friends all bore me why can’t we be alone/I don’t want to speak to no-one else/I just want to hide like holy innocents/I met you at the fountain outside the station/Nothing else matters except dull conversation/Our whole world and holy innocents…” This song is entirely different from the rest of the songs on Soapbox and is a true representation of this band’s musical abilities and variety. Marcy is the rockiest track on the record by far. It has punch and energy. The vocals have a distorted effect giving it that rock edge. The vocals are much less controlled than on the previous tracks, “Marcy my dear you got me strung out”. You’re bound to love this track instantly. Soapbox, the title track of record, ends the record and what a song to go out on. Its fast tempo and high pitched, scattered guitar riffs bring energy and life to the end of the album. The guitar riffs almost sound like improvisation which gives Soapbox a unique feel. Soapbox is a wonderful album full of lows and heartache yet the songs’ upbeat tempos and summery vibes help to give this record a pleasant feel. There’s a lot to be said for The Crookes’ sound. You’ll find something to love here. 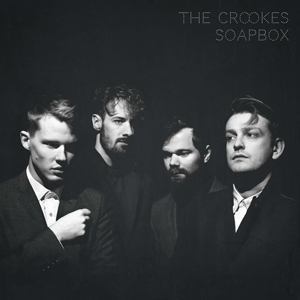 The Crookes’ new album, Soapbox, is due out on 14 April via fierce panda records. The fierce panda record company turned 20 years old on February 24. To mark this somewhat surprising event the label is releasing an 18-track compilation comprised of some of the weepiest tunes it has released over the past ten years. Due for release as its own separate entity on Monday 7 April, the album is called endangered: fierce panda 2004–2014 and will be given away to anyone and everyone who buys a record from the online shop at www.fiercepanda.co.uk. In 1994 fierce panda records was invented by three NME journalists in The Blue Posts on Tottenham Court Road. Their intentions were clear: to release the Shagging In The Streets EP, the double-vinyl six-track tribute to the magnesium flare which was The New Wave Of New Wave, and then call it a day – you don’t call yourself something as trite as fierce panda if you intend to make it to Christmas. That day was February 24 and would never be the same again. Time, as tends to be the case, has moved on: The Blue Posts is now a Boots chemist and The New Wave Of New Wave is now a footnote in the NME scene-inventing filing cabinet. Unbelievably however fierce panda has survived against several odds, flourishing throughout the end of the previous century with a cavalcade of cheery one-off singles and cripplingly cheekily-titled compilation EPs like Mortal Wombat and Otter Than July. And Songs About Plucking. And Screecher Comforts…the list is endless. Indeed, in 2004 fierce panda records released decade: ten years of fierce panda, a compilation album which hauled together a savvy selection of those pivotal singles and early nuggets from the likes of Placebo, Ash, The Bluetones, Idlewild, Coldplay, Keane, Death Cab For Cutie and – but of course – Winnebago Deal. Time, as still tends to be the case, has moved on again. Having retired from the world of one-off singles in 2006 fierce panda has been attempting to make some kind of sense in a music industry gone mad. There is fierce panda songs for publishing, there is fierce panda management for managing, there is even fierce panda books for, umm, booking. And there have been fierce panda albums. Lots and lots of lovely great big grown up albums. Which bring us rather too neatly to endangered: fierce panda 2004–2014, a compilation album which starts with The Saddest Music In The World by Woodpigeon and ends with one of the saddest songs in the world in Sovereign by Ultrasound. In between is a gentle, genteel and occasionally very grumpy emotional rollercoaster ride through the past ten years of slow-moving independent chaos. The artwork is cribbed from The Hurting by Tears For Fears. The vibe is taken from a deserted old man’s pub in the middle of a long, lost afternoon. All 18 songs are culled from the multitude of fierce panda albums and mini-albums released since 2004. Perversely, for a record which pertains to be a Best Of… collection, several of the tracks on the compilation were never released as singles because they were too long, too languid or just too damn lovely. Even more perversely, some of these languid, lovely, too-long tracks were actually released as singles. What fierce panda do know is that, far from those early snotty New Wave Of New Wave-raving days in The Blue Posts, two of these bands have recently been playlisted on the comfy airwaves of Radio 2 and another six of them should have been. Terrible sacrifices have been made. Because all the tracks are off albums, they’ve had to leave behind classic fierce panda one-off singles from Battle, The Maccabees, Boy Kill Boy and Dead Disco. 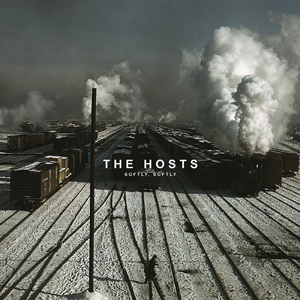 Because all of the compilation tracks are endeavouring to capture a sense of slow-moving sadness, they have had to leave out the heavy monster sounds of Hawk Eyes, The Blackout and The Computers. And how How Come You Don’t Hold Me No More by Welsh Wonders The Hot Puppies – who put the ABBA into Aberystwyth – isn’t on here only the traumatised compiler knows. endangered: fierce panda 2004 – 2014 sees the record label going from Shagging In The Streets to sobbing under the sheets. It’s been one heck of a journey. endangered: fierce panda 2004 – 2014 will be released on 7 April.